Dr. Paulvin works in a specialized field where he is faced with people battling chronic pain. Dr. Paulvin uses advanced functional medicine and a comprehensive treatment approach to help find relief for his patients. A with all forms of functional or alternative medicine, gaining the trust and commitment of the patient is the initial, and most important step of the process. We made a website that would help reassure and comfort patients with its modern design elements and navigational ease. When patients in need of relief visit a website, the first thing on their mind is a reassurance. We made sure that all the essential information about Dr. Paulvin’s philosophy, along with additional credentials, testimonials, and information would be easily accessible. The top of the homepage features an extensive photo gallery that highlights the different services Dr. Paulvin has to offer. down below, you will have the option to book an appointment and learn about all the different issues that Dr. Paulvin specializes with. We rounded out the homepage with additional links to the doctor’s blog page and social media. The two main colors used on the website are blue and white. However, we did add in a sprinkle of gold to highlight certain call to actions. Blue and white mesh well together, considering the specialty Dr. Paulvins works under. When you scroll over any tab on the navigation menu, the words turn to grey. Grey is a neutral color that helps add an aesthetic contrast to the site. In addition, the blue and white blend tastefully with the professional photographs provided by Dr. Paulvin – a great representation of both functional medicine and New York City. The navigation menu features a drop-down element that expands when you scroll over it. Not only does this keep information neat and organized, but it also helps provide sensible spacing throughout the website. As with all our websites, space is expertly managed to help establish harmony with the surrounding text and images. Throughout the website, there are images that complement the text. Most of the pictures on the website feature Dr. Paulvin himself. Not only does this create a more secure sense of trust with the first-time web visitors, but it also shows firsthand how much time and effort the doctor places into his craft. The packages tab is home to all the different deals that Dr. Paulvin offers. Each package comes with an appropriate description of the product along with rotating pictures on the side. We incorporated parallax effects throughout the website as well. Square borders throughout the website help keep everything appropriately in place. 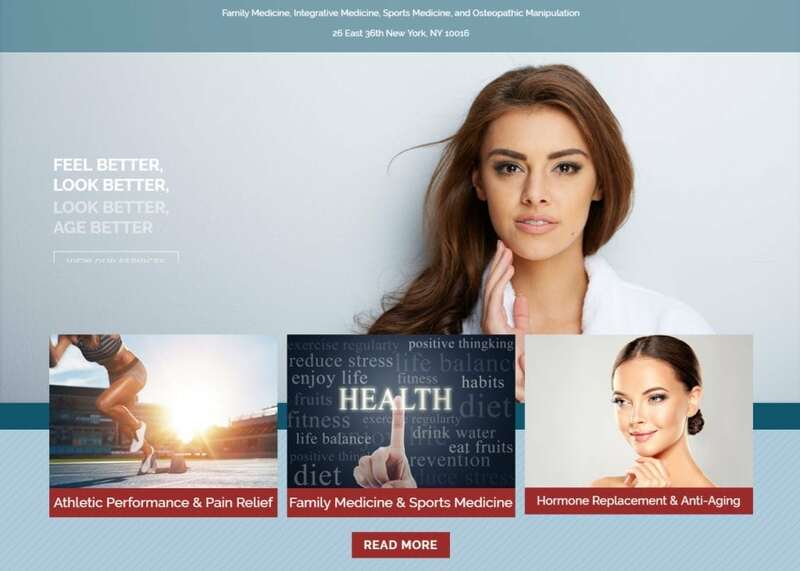 Along with the additional packages that Dr. Paulvin offers, the corporate wellness tab allows you to customize your program to tailor to your needs. On the navigation menu, we also have included a tab for Dr. Paulvin’s blog. Blogging is one of the best ways to organically market your services. The doctor’s blogs are eye-catching and informative. When something looks appealing or different, we tend to gravitate towards it by nature. When visitors first enter the website, they will notice an interactive chat menu available for them on the right side of the web page. This allows patients to send a direct message to Dr. Paulvin himself! Not only does this add a hint of distractibility and flair to the website, but it also can also be a great way to engage new or skeptical patients. If you ever want to find Dr. Paulvin’s social media platforms, look no further than the top banner of any given web page. All the social media platforms are displayed as widgets for the patient’s convenience.